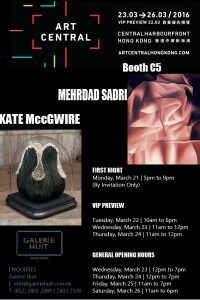 Galerie Huit is delighted to present works by British artist, Kate MccGwire (b. 1964) and Iranian artist, Mehrdad Sadri (b. 1944) at Art Central 2016. Both the textured sculptures by MccGwire and abstract paintings by Sadri have been brought together for Art Central to highlight duality in form, either re-created in the large painted creases and folds in Sadri’s paintings or demonstrated through the use of organic and natural materials in MccGwire’s feathered sculptures. MccGwire is widely known for creating meticulously fabricated feather sculptures and installations. A source of inspiration is Freud’s ‘Unheimliche’, the idea that something familiar can excite fear. Through the meditative process of collecting discarded feathers from various sources over time, and then assembling them into artworks, MccGwire elevates such feathers from being waste materials to becoming part of a sculpture. Addressing the duality of cultural associations connected to birds and their feathers – one that is linked to purity and fertility, and the other that is connected to dirtiness and foulness, MccGwire’s deeply sumptuous works encourage viewers to look at the pure beauty of nature, once removed from its everyday associations. Mehrdad Sadri’s evocative paintings invite viewers to look at fabric folds and creases from a novel perspective. The folds seen in everyday life are magnified on Sadri’s canvases to almost infinity without ends on both sides. By doing this, the form suggests the texture and shape of folded fabric. Shifting duality plays an important part in Sadri’s pieces, where a spatial illusion is created through decisions based on light and shade and whether to include or exclude elements. Such opposite poles are metaphors for natural forces of generation and change.